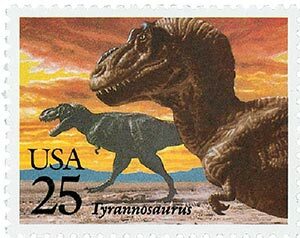 While searching for fossils in South Dakota, paleontologist Sue Hendrickson made a colossal discovery on August 12, 1990. Working with the Black Hills Institute of Geological Research, Hendrickson and a team of workers had spent the summer exploring the Cheyenne River Indian Reservation. After discovering Edmontosaurus bones, they prepared to leave, but got a flat tire. While the rest of the group went to a nearby town to fix the truck, Hendrickson decided to explore some nearby cliffs that they hadn’t visited. Near the base of a cliff, she found small pieces of bone, then looked up to see much larger bones sticking out of the cliff wall. She immediately reported this to institute’s president who determined the bones were that of a Tyrannosaurus rex. Hendrickson and a small group remained at the site to excavate the bones, and were excited to find how much had been preserved. Once all the bones were collected, they realized it was 90 percent complete – the largest amount of a T-rex skeleton ever discovered. Further study led them to conclude that the T-rex had been covered by mud and water shortly after its death, protecting it from scavenging by other animals. The T-rex, named Sue after its discoverer, was quickly the center of a legal dispute. The Black Hill Institute, Maurice Williams (who owned the land where it was found), and the U.S. Department of the Interior (which held that land in a trust) all staked a claim to it. In 1992, the F.B.I. raided the site where the bones were kept and seized them until the dispute was settled. A court eventually ruled in favor of Mr. Williams, who decided to sell the bones at auction. The Field Museum in Chicago feared a private collector would buy the bones, and the public would never get to see them. They requested and received assistance from the California State University System, Walt Disney Parks and Resorts, McDonalds, Ronald McDonald House Charities, and individual donors. They won the auction, paying $7.6 million for Sue. The bones were then placed in observation labs at the Field Museum as well as the Animal Kingdom in Orlando’s Disney World, allowing millions of people to witness their preparation. Scientists also used Boeing’s CT scanner to examine damage to the bones, discovering a variety of injuries Sue experienced. Sue made her public debut on May 17, 2000, with more than 10,000 excited visitors present. Her skeleton stands 13 feet tall, 42 feet long and is estimated to have weighed over 6.4 metric tons when alive. 6 Responses to "This Day in History… August 12, 1990"
An excellent story, thank you. I truly enjoy “This Day in History.” The articles are well written and concise. Pairing these with stamp images allows a great pictorial of history. Keep up the good work! Really enjoy reading “Day in History” and seeing the appropriate commemoration with a stamp. Thanks Don and Mystic for all the great information at TDH. Great story. But where is Sue now? In the Field Museum or in South Dakota?